Taurus provides an user interface for browsing TaurusMainWindow setting files (.ini files), allowing a power user to visualize and edit the different perspectives of a Taurus GUI. The configuration tree is organized in branches, with the perspective at the root. 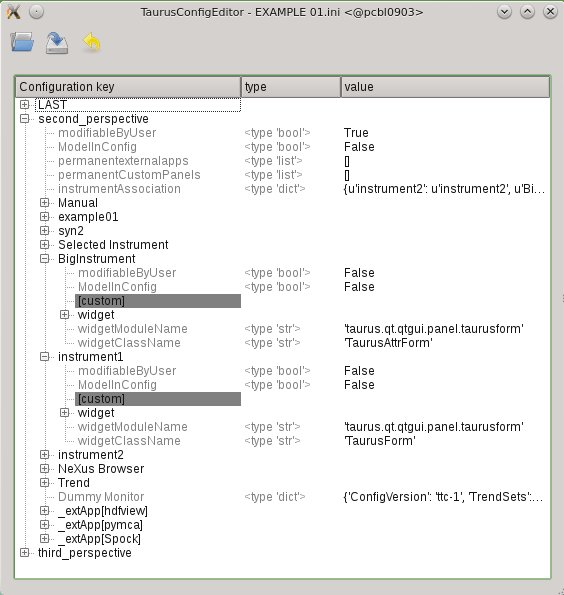 In the figure below the taurusconfigbrowser application shows a taurus configuration .ini file containing three perspectives: ‘LAST’, ‘second_perspective’ and ‘third_perspective’. ‘LAST’ is an special perspective automatically stored just before the closing of the Taurus GUI; it reflects the state of the GUI just before the last closing. The other two perspectives were saved explicitly during the Taurus GUI execution.